Who doesn’t have great memories of Coca Cola’s soccer figurines from the 86’ and 94’ World Cup? We would play pickup all day, the loser buys the cokes, and then collect the coke tops to trade in for figurines. I remember bringing my favorite players to life in my living room. We would recreate the matches on tv on the floor. Living each goal in person and screaming it with all our passion. Those great childhood memories are coming back. 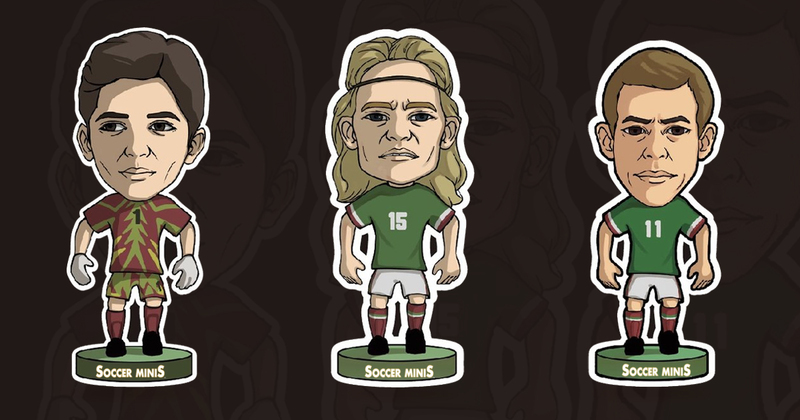 This time, the newest sensation in soccer figurine collectibles is a couple of weeks away from launching their preorder crowd funding campaign. Soccer Minis™ are officially licensed soccer collectibles of your favorite players and they will help you recreate those childhood memories, this time with your children. Soccer Minis™ have already announced the first two figurines of their inaugural series 1 collection set. The collection will begin with a Mexican Legend Jorge Campos and Luis Hernandez. A third player should be announced soon. So far, the photos of the pre-production samples are incredibly good. Matador and Campos look amazing and the detail in Jorge Campos’ uniform, his traditional colorful kits, is impressive. We can’t wait to see what the final product comes out. According to their website, they are close to signing a licensing agreement with a major national team leading up to the Russian World Cup in 2018 and then after focusing on club teams. We can’t wait for that announcement. More importantly, we can’t wait for the launch of the kickstarter campaign via Indiegogo. If you want to check out Soccer Minis™ and their prelaunch page please visit the link. You can read more about them there and register your email to stay up to date for the preorder date launch!